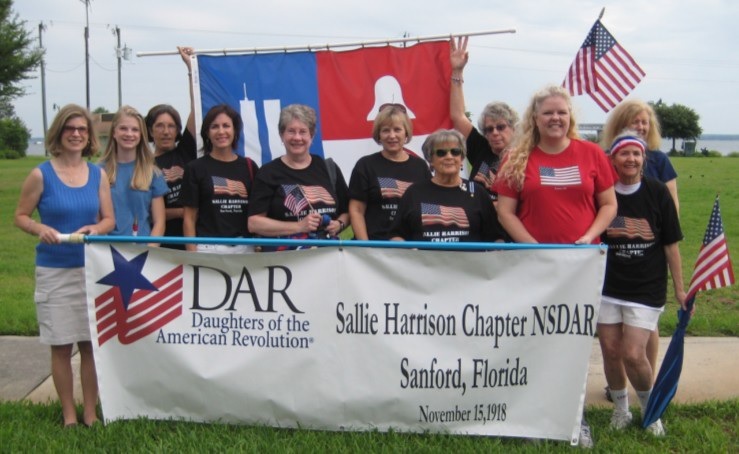 The Sallie Harrison Chapter has a long history of activities in support of the Florida State Society (FSSDAR) and National Society (NSDAR) Daughters of the American Revolution's objectives including: new and prospective member events; Constitution Week proclamations; military observances; women’s issues discussions; commemorative events; donations to the DAR Library; and end of year memorial services. The Annual Youth Awards Program and Tea honors the winners of essays for the DAR Good Citizens Award, American History and the Christopher Columbus Essay Contests. Each year, chapter officers award medals and certificates to the outstanding JROTC students at the eight Seminole County high schools. The chapter supports the DAR schools, particularly Tamassee DAR School. We also contribute to the “Flags for the Classroom” fund for Seminole County schools. Daughters regularly participate in a range of veterans' projects and Stand Down events aimed at helping make life a little easier for veterans by providing clothing items, books, and toiletries. In 1999, a memorial plaque was placed at the grave of Elizabeth Starling, founding regent of the chapter. In 2010, the chapter facilitated a Special Projects Grant for the Seminole County History Museum. As the chapter continues to grow, Daughters proudly support the mission of the NSDAR for historic preservation, education, and patriotism. Click here to download a PDF of our chapter brochure. Chapter events and activities, such as Sanford's Memorial Day parade, provide opportunities for members to support our Seminole County community.